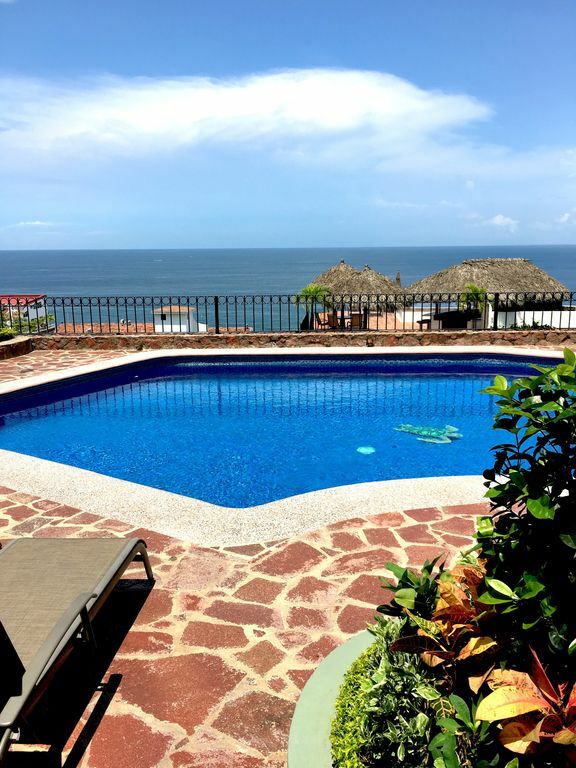 Walking distance to the downtown and Los Muertos Beach on the south side of Puerto Vallarta, one of the “Top 10” international vacation destinations. 10 minute walk to Los Muertos Beach. Away from the noise of bars and nightclubs and construction in the Romantic Zone proper but close enough to walk. This condo is a perfect place for couples or honeymooners. Your vacation condo provides a view of the bay from a spacious terrace. Sit out on the terrace, enjoy the sunset or read a book. It is in a building with 15 other units and is located on the second floor. There are six steps from the main entrance to the elevator which accesses all floors and the pool area. There are two master suites One has a king-size bed with a bath that has a shower. The other has two twin beds with a bath and shower. The twin beds can be made into a king with advance request. Each has large closets. There are black out blinds in both bedrooms. A hairdryer is available. The condo comes fully equipped with linens (beach towels included) , kitchen appliances, dishwasher, microwave, refrigerator with ice maker. There are dishes, pots and pans, cutlery, blender, and coffee maker and espresso machine. A washer and dryer are available in the utility room. The building has a purified water system., so you can drink the water out of tap if you wish. There are wonderful breezes off the bay. Ceiling fans and air conditioning are also available. There is a Smart TV in the living room and the master bedroom where you can watch Netflix or other shows on the internet. Fiber Optic Wireless internet is available in the condo and at the pool. The complex has a large pool that is heated during the winter months, so swimming is possible all year round. It is about a 10 minute walk to Los Muertos beach and the Zona Romantica. A private staires leads from the pool area down to street level. Taxis are available on the highway if you do not walk and cost $50 pesos to the south side of Puerto Vallarta. Just across the street there are stairs which will lead down to Los Muertos Beach. Blue Chairs Resort is just a short distance. There is a safe for your valuables and the complex is monitored 24 hours per day by security cameras. Property manager that fell in love with Puerto Vallarta several years ago. I have 2 other properties there. This property is close to Los Muertos Beach and has a great heated swimming pool. Perfect for couples. It is very convenient to Los Muertos Beach and much quieter than being closer to Los Muertos beach and the Romantic Zone. Great pool for swimming and sunning. Small building without huge crowds or people at the pool. Let me know in advance if you need high chair. attaches to seats. Flat screen Smart TV in living room and master bedroom. with DVD player. in lobby there are table and chairs. On terrace. Not in condo. The condo more than met our expectations. Tom & Carlos were quick to respond to our questions. Weekly cleaning was unexpected and much appreciated. The location could not have been better. Thanks to all the steps we didn't gain the vacation extra pounds. Nice quiet safe great location very well managed building I would welcome staying their again. Nice pool area . The unit had everything we needed to make this a very pleasant experience. Thank you. Come back again. Everything was perfect! Condo is exactly as the photos show. Extremely clean, well appointed. Tom responded almost immediately to any questions we had. I would definitely recommend this condo! Thank you. Glad you enjoyed your stay. Come back again. A beautiful stress free vacation in a well equipped condo located in cozy 15 unit complex. Tom has a nice condo that is well equipped. The location is very well cared for and a great place to relax. The shared areas of the complex are immaculate. The complex caretaker Rodolfo was very helpful and responsive to any questions. Carlos and Vannessa who take care of the condo itself in terms of check in/out, maintenance and cleaning were excellent. Tom has a great location only a few minutes walk from downtown regardless of which of fhe 3 available routes chosen. Walking back up from downtown provides enough excercise to justify your next meal out or an extra drink(only 50 pesos by cab if you don't have the energy). Tom touched base with us regularly to ensure all was well with the unit and our stay. During the day many times we were the only people utilizing the pool area so it was almost like having a private place. The view of the bay is excellent and we were able to see dolphins jumping and schools of herring feeding on the surface of the water, unfortunately we were a little early in the season for whales (bring binoculaurs). The kitchen is suitably equipped and the fridge has an ice maker. The only thing missing was a blender for making daquiris etc...and go cups for taking drinks to the pool (we left ours for the next guests). We wouldn't hesitate to stay here again. Thanks for letting us stay in your home Tom. Thanks Carson for your kind words. The old blender broke and I hadnt had a chance to replace it. The condo now has a blender again. Tom was helpful throughout. He organized for Vanessa to greet us upon arrival and emailed the next day to check that everything was good. The condo is lovely and the covered outdoor terrace was wonderful. The condo was clean, with a well-equipped kitchen and nice furnishings. The pool is large and warm and the pool area was great for lounging. We loved the walk home, up the stairs, for wearing off nachos and beers, after an evening out in the Romantic Zone . Thank you. I am glad you enjoyed your stay. Come again. We are seniors and are seasoned travelers. My review may be biased by age. We stayed for a month. Pros: 2 smart TV's, internet, free phone service to states, spacious for 2 people, nice water view, beautiful pool area, complex is well maintained, comfortable bed, close to town but not necessarily easy to access. Condo is located in nice quiet area on hills. Tom the landlord responded in a timely way to questions about condo. He was especially helpful and informative by giving me medical information in the area if we needed it. Cons: furniture in living area is very uncomfortable-low and hard- to sit on for even short periods of time, kitchen pots and pans were knicked and scratched, safe did not function, a/c was very loud. We only used it at night. Luckily there was a beautiful breeze during day. 2nd bedroom faced street and didn't see screens to open window. Although the condo is near town, it requires climbing and walking down steep hills. We took taxis back. Because of this we tended to feel a little confined and needed to plan activities around our trip to town. No instructions were provided on how to initially work tv and dial info for phone , some numbers for safe and internet on printout landlord gives was incorrect. This is our opinion and how it met our needs. I am sorry I was not able to greet you upon your arrival and could have cleared up many of your questions but you arrived one date late due to your husband's medical problems and I had a trip planned to Mexico City so had to get someone that works for me that is not totally fluent in English to greet you..
You never mentioned any problems with the safe or the television controls to me which could have been cleared up easily. The air conditioner is a mini split and I will check it and see about the fan noise. You never mentioned it as an issue. I am sorry that the condo did not meet your needs.